In the framework of the Kyoto Protocol the Clean Developement Mechanism (CDM) has been implemented to promote a sustainable development in developing countries. On behalf of the German Federal Ministry for the Environment, Nature Preservation and Nuclear Safety (FDE) a guide has been produced, named "Utilization of the Clean Development Mechanism (CDM) in Waste Management - Guide to Foreign Investment Projects". In addition to this guide bifa text No. 42 contains the results of in-depth analysis which resulted in several findings about obstacles and errors within the UNFCCC framework (United Nations Framework Convention on Climate Change). 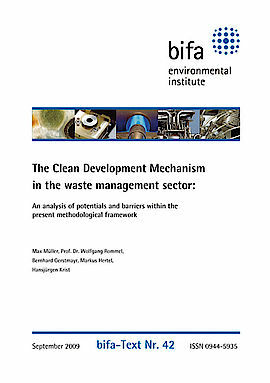 This work examines possible forms and related consequences of CDM projects in the waste management sector. The social aspects of implementing highly sophisticated waste management systems in the developing world are highlighted. In these countries effects of competition can occur against the wastepickers, which are mostly extremly poor people earning their livelihood from waste collection. 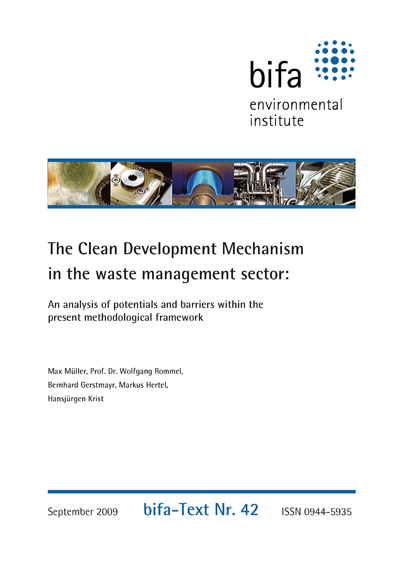 Furthermore the potentials of diverse treatment options are simulated according to UNFCCC methodology AM0025 and hindrances in the present methodological framework identified to provide a holistic picture of the CDM in the waste sector. You can buy bifa-Text No. 42 as print-on-demand at ASK-EU (9,00 Euro) or directly at bifa as a printversion (18,00 Euro + VAT. + Postage).